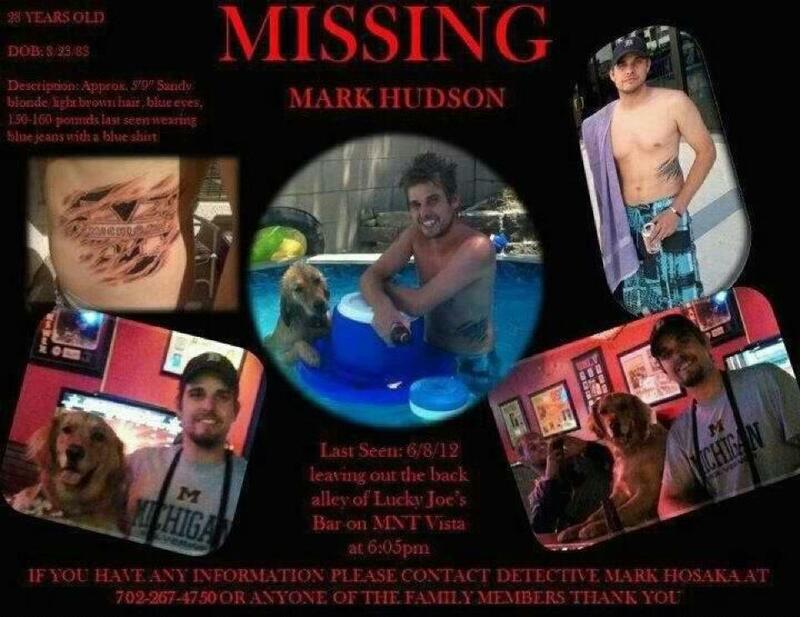 This request comes from the family of Mark Hudson that have lost contact with him. They have not heard from him and do not know where he is at this time. Mark Hudson, 28, is missing from Nevada. He was last seen leaving Lucky Joe’s bar on Mountain Vista Street and Ramrod in Henderson, Nevada. Mark was wearing blue jeans and a blue shirt. He is 150-160 pounds and 5’9″ tall. 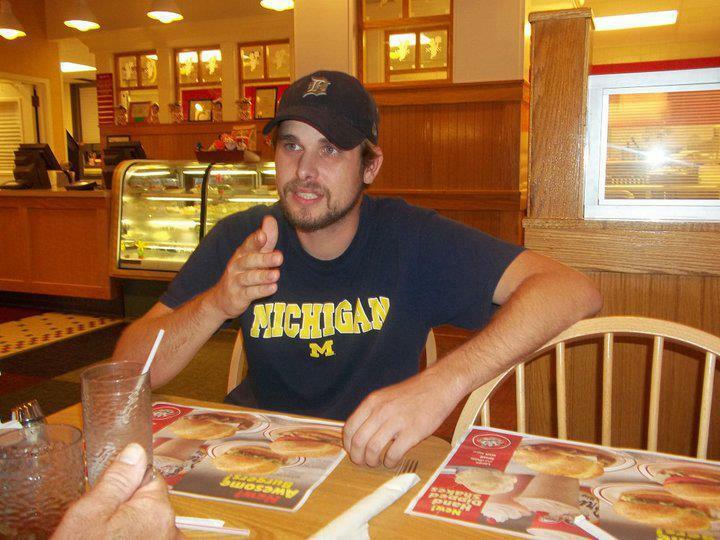 He has two tattoos, a Michigan “M” on his left side near his ribs and an old English “D” on his upper right arm. If you have any information, please let me know. You can remain anonymous. Because I do not believe all these missing men are random disappearances,but many are assinations done in a way that is a riddle like Killing Chris Olberding in Cincinatti Ohio whose car was found at Anderson Ferry and towed by Millenium towing and then Adam Falcon shortly after at the Tick tock Inn.-Tick – Tack -tow They are probably also often calling the police as a fake witness and concerned citizen. They were probably Adam smith when Anthony Skifton went missing. Fisher when Luke and Walker went missing. The person that said someone was in the water when Morgan White went missing. The person that said they thought someone was in the water one year to the date someone went missing from Splashes Nightclub. In other words this has been going on a long time. A person was turned in for doing such a thing. Look for the story Coleen Henry did-six disappearances coincidence or serial killer. Apparently LE misunderstood that she was getting the initials of missing men in e mails instead of that he may have in fact been using the initials of missing men ,among other things. he was turned in for sending threatning e mails . The cryptic clues themselves may not have been in e mails at all. In other words it seems LE has botched the investigation and so has many individual police agencies. They said someone was in the water with a white shirt. Morgan White was not wearing a white shirt. They said they heard a splash one year to the date the splashes nightclub vicyim went missing. They find a young man and report his shorts were down and someone claims to be a truck driver for Strohs. Alex goes missing in Spokane and another Alex that was a volunteer for meals on wheels and then with a later disappearance they get a call from an axle tech security guard. I don't know the area. Eric Duffy was at Joes bar. Was on golf team. Someone said they heard someone yelling for help at about 1:30 a.m. Saturday near the Clark Street bridge. I know Henderson is Clark County.A lot of places would makes sense. 1/23/10 Lachlan (Cran)swick vanished in the (sleepy) town of Deep River, 190 kilometres north-west of Canada's capital, Ottawa, five weeks ago. In the legend of Sleepy Hallow icabod Crane goes to a party at the Vantassel's ball room. Albrecht of Mapleton walked away from his father and a friend after they finished fixing a vehicle near the Kato Ballroom. You should compare with other disappearances at bars. Some could be related and because no one is sharing info it will never be proved. He asks where the back door is yet we do not even have a description of men. What is the point of even posting anything when no pone tell you things that could be important? There are a lot of people on survellance vids etc seen with people before they disappear from bars yet no one does anything about it . But anyway here is someone you should probably have anyone that saw who was in the bar look at. bottom of page.